A Buddhist temple is the place of worship for Buddhists, the followers of Buddhism. They include the structures called stupa, wat and pagoda in different regions and languages. 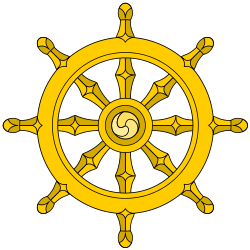 Temples in Buddhism represent the pure land or pure environment of a Buddha. Traditional Buddhist temples are designed to inspire inner and outer peace. Its structure and architecture varies from region to region. Usually, the temple consists not only of its buildings, but also the surrounding environment. The Buddhist temples are designed to symbolize 5 elements: Fire, Air, Earth, Water, and Wisdom. The wat of Chinese temples (寺) typically includes a Main Hall and a Hall of the Heavenly Kings. The wat of Japanese temples typically include a Main Hall. A distinctive feature is the chinjusha, a Shinto shrine devoted to the temple's kami. ↑ "New York Buddhist Temple for World Peace". Kadampanewyork.org. 1997-08-01. Retrieved 2012-06-20.